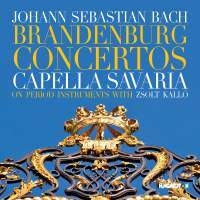 There is not much Bach in the Capella Savaria discography but this Brandenburg Concertos set follows on from a violin concertos disc issued only last year (4/15), and shows remarkable consistency with it in its various strengths and weaknesses. The most oddly idiosyncratic of them is a tendency for first-movement tempi to sound a little rushed and unsettled, while finales (into which category, as a type, we can put the third movement of No 1) tend to hit the road with just the right mix of pace and control, No 3 being the only exception. Their best overall performance is a buoyant, grainy and gutsy No 6, while other highlights include a well-judged balance in No 1 between the ‘outdoor’ and ‘indoor’ personae of the horns, some brightly confident trumpet-playing by László Borsódy in No 2, and in No 3 some pleasingly varied bass-line articulation in the downward passage at 3'23" in the first movement and a tidy solution to the twochord second-movement problem. Taken as a whole, however, these readings are unexceptional and uneventful; and indeed, in slow movements, often rather perfunctory. While the standard of playing is perfectly acceptable, the phrasing can be haphazard and the orchestral sound just that little bit more coarse and unfinished than it should be. The recorded image could also be more spacious. You’ll probably have guessed by now that I can’t see this recording as one to challenge the best in a field so teeming with talent. There are many other Brandenburg experiences more likely to excite, and thus there seems little reason to choose it over, for example, the keen zing of the Dunedin Consort (Linn, A/13), the suave polish of Florilegium (Channel Classics, 1/15), the relaxed expertise of Trevor Pinnock’s European Brandenburg Ensemble (Avie, 3/08) or, if you want some real adventure, the fast-car thrill of Musica Antiqua Köln (Archiv, 3/88).